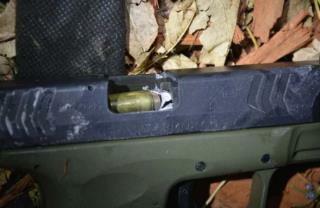 (Newser) – In what a Colorado district attorney calls a "one in a billion shot," a Jefferson County deputy successfully disabled a robber's gun by firing a bullet down its barrel, the Denver Post reports. According to KUSA, the shooting happened in January, but authorities released their report on it this week. On Jan. 26, Jose Marquez was off duty and visiting his girlfriend at her apartment in Aurora when he was confronted by two masked men, KFOR reports. One of the men pulled a gun, so Marquez went for his. The robber shot Marquez twice in the stomach and once in the shoulder. Miraculously, Marquez was able to return fire. Even more miraculous was where one of his four shots ended up. If he was trying to hit the tip of a gun, amazing, stupid. To be one in a billion there would have to be a billion opportunities to attempt this. And, of course, he was not even attempting it, so anyone who was would have a better chance. How many total shots are there and we can figure out if that can ever be done again. And if he does not know how many then he is in no position to quantify the odds in the first place. Except of course in places like this, safe from scholarship and real review.